Right where I usually am. My digs in Virginia. I could say I’ve been busy and that would be true. I could also say I’ve been dry and that would be true. I could also say I’ve been processing some stuff and that would be true too. So a lot of stuff’s been going on and it’s made for not much writing. Some of that means that I’m getting more and more frustrated with myself, so that’s coming to an end … maybe. I’ve got some ideas that I’ve started on and I want to flesh out. Hopefully I’ll be able to do that. For now though, here’s what’s been happening in the LightHouse over the past couple of months … well, some of the highlights anyway. LightGirl’s U16 Girls hockey team finished their season 2nd in their league. They went to an end of season tournament and played up a step in terms of the level of teams they’d faced all season. They lost every game, but played hard and learned a lot about where they want to go next year. They played three games in one day; these were 16 hard playing tired hockey girls at the end of the day. I think she had a weekend off and then Spring Season began. She played on co-ed intramural team and had a ball. There was another goalie on the team so she had someone to share goaltending duties with, and two other girls that were her friends. I’ve never met a coach who put less stress on his players while still managing to teach them and lead them. He was really good with those kids. I have to say … he made a terrible club president, but an excellent coach. In the middle of that she had tryouts for the 2009-2010 Travel Season. From the moment LightGirl thought about playing hockey, she’s wanted to play on a boy’s team. Last spring she tried out as a skater for the appropriately aged boy’s team and missed it because she was afraid to play defense (she’d never played it before). This year she tried out as a goalie for the U16Midgets. That is the Midget team that are Under 16 years old. Boys. One day I’ll do a post on the nonsensical names for age classifications in hockey. There were five goalies vying for four positions. Two of the five were girls. Another (different) two were wicked good. It was a high stress weekend that brought on a minor (very minor) replay of pancreatitis for me. LightBoy also decided that he would try out for a travel team. His age group is known as the Pee Wees. Between the two of them … LightGirl trying out for the Girls and the Midgets and LightBoy trying out for the Pee Wees … I believe they had a total of 13 ice times that weekend. Did I mention it was Mother’s Day weekend? I spent Mother’s day at the rink and received a soggy rose for my efforts. By the end of the day on Sunday I could feel the familiar twinge in my upper abdomen that signaled my pancreas was not happy with something. Fortunately, I know how to handle this now and instead of four days in the hospital I changed my diet and took it easy for a few days. LightGirl was invited to join the U16Midget Minor team that Sunday night. And we were left to wonder what the heck that meant. It wasn’t long before we found out. The club had a large number of players in her birth year (who will be first year players in that age classification … in other words they can play for two years as a U16 team) and a slightly smaller number in the year ahead of her; enough that they could field two teams. One is a mix of both years; the other is just her birth year. She is on the latter. The club has been waiting to field a team that is year specific. So it will be interesting to see how they do. This raised some issues in our house. LightGirl has played with the same girls for three years now and made some great friends. It’s a close team. The parents know each other fairly well; we do spend quite a fair amount of time together, afterall. It was a hard decision in some ways and others a no-brainer, but LightGirl decided to play with the boys for the coming season. So this summer has been about that transition. Discovering who her new teammates are. Off ice conditioning so that she can keep up with the boys. And the emotional fall out of leaving her friends behind. In the meantime, LightBoy has discovered a certain talent for marksmanship and computer programming. So even while he is working his hockey skills, he’s also learning archery, guns and is building computer games using a program called Scratch. He’s also decided that he wants to take on Linux this year, so he’ll be figuring that out along the way. Twelve is an awkward age for boys, in particular. He’s also been very interested in paintball and airsoft. He has a lot of equipment and goes out with his friends to both official fields and backyards on missions. They spend alot of time plotting, planning and strategizing. He has also engineered at least one new gun for airsoft out of pvc and other parts including duct tape. Yes, it does work. I have been working with two friends (one of which is BlazingEwe) to start a new business. Quilting, of course. We have a website and we’re taking it slow. We’ve sold two quilts on commission thus far. It’s probably not a great time, economically speaking to start a quilting business. Oh well … Our business is called Needle In Peace and that link will take you to our website. Once there you can get to our Flickr site and see many of our quilts. I also discovered back in March that my thyroid is failing. This seems to be a family trait as my father, his sister and my brother all have the problem as well. My primary care physician was attempting to handle this, but I’d prefer to see an endocrinologist who knows all the signs and symptoms as well as all the blood tests to look at. So I have that appointment scheduled when we return from Vermont as I’m still not feeling quite well. So … there you have it, in a very large nutshell. Where I’ve been and what’s been going on. More to come soon. I made a decision last year sometime. I don’t remember when it was. But I remembered it this year and I had time to make good on it. The decision was that I would make our Christmas gifts for extended family members. I think the decision began sometime around “Make Something Day,” but by then it was too late for me. Especially since I had 35 people in my house that day. And it took me … uh … weeks to recuperate. This year is different. We’re not having a big, ornate Thanksgiving. The day after LightHusband is taking the LightKids to go play paintball with one of his compatriots at work. Most importantly, we are not painting the house all autumn. On the other hand … this means that the house is all wrecky. And making me slightly insane. So I have spent the last several days pouring through tutorial websites, blogs and magazines finding cool things to make for my nieces, nephews, siblings, in-laws, out-laws, etc. There was a condition though. I had to have most, if not all, of the materials on hand for the project. And it has to be fairly simple. In other words, these gifts have to be made out of stuff I already have and not take too much time or energy. There will be a few things I have to purchase (like some plastic mesh to make a fabric garage & doll house). But for the most part, I will be able to make these gifts with stuff I already have. Then I spent an inordinate amount of time organizing myself. Making lists of what I would make and in what order. I’m using Evernote to keep track of all the websites and people/gift recipients, and I’m using Things to keep track of the when and how. If you’re also interested in making your gifts this year, start with Sew Mama Sew. It’s a group blog and they’re doing gift tutorials every day this month that link to other blogs, which (of course, branch out to others. For even more inspiration, they did this last year, so if you click on “November 2007” you get even more ideas. Everyday they have gift ideas centered on a particular theme (such as teachers, or books or cold weather) with tutorials, gifts to buy that are handmade, patterns to buy and then homemade food recipes (like homemade marshmallows! yum!). Mission number two involves the hockey team (what else?). We’re traveling out of state about 12 days before Christmas to play a couple of games. This involves a hotel stay. I usually organize some activity while we’re in the hotel to prevent large groups of young women from roaming the corridors in the evening teeheeing and making too much noise for the other guests. The girls don’t seem to understand that no one else wants to hear them. So for this trip I’m organizing dinner out and then a Christmas party back at the hotel. I thought it would be a good idea (based on some discussions last year) if the Christmas party were to involve some sort of charitable activity/donation to a local shelter. So I have to call them this morning and find out what we might be able to do for them in that situation. That’s just an extra wrinkle in my planning/organizing. I’ve found a bunch of fun games for the tween/teen set that can be played in a hotel setting. We’ll be having fun. Mission number three is to return to my old tradition of making plum pudding this year. I use my Welsh great, great grandmother’s recipe handed down to me by my grandmother. I dropped it for a couple of years because I was having such a difficult time finding suet, among other things. But I think I can find it again this year. So I’ll be making my plum puddings in a couple of weeks. Ready to go for Christmas dinner. YUM!! UPDATE: Eureka! I found the suet at a small local butcher shop about 7 miles out of town. When giving directions, the man told it was next to some antique shops and he said, “But you have to spend more here than on antiques,” in a gravelly southern accent. I cheerfully assured him I’d rather have some good beef than an antique (never mentioning that this close to DC they’re likely to be overpriced junk in any case). I’m going to pick it up this afternoon. And dig out my grandmother’s recipe to get the rest of the ingredients this weekend. In all, though, my missions seem to be taking me away from the computer. In addition, I’m trying to do more reading and I have some quilts that are slowly being pieced as well. So if you don’t see me very much around here, don’t worry. I’m still here. Just trying to be faithful to my missions and get them accomplished. You’ll prob’ly see more of me in the New Year. As I stay off the roads while LightGirl learns to drive!!! Thanks to all for your kind words and encouragement for our quilt yesterday. BlazingEwe and I are very happy with that achievement, but we have plans to make another just for us using color in another more dramatic fashion. We play with color in the way that some people play with marbles. And it gives us great pleasure indeed. So she and I and another friend are starting a quilting company. Yes, I’m saying that in my outloud voice and with great trepidation. We actually have a customer and are working on our first consignment quilt. It’s due on or before October 31, the recipient’s twenty-first birthday. 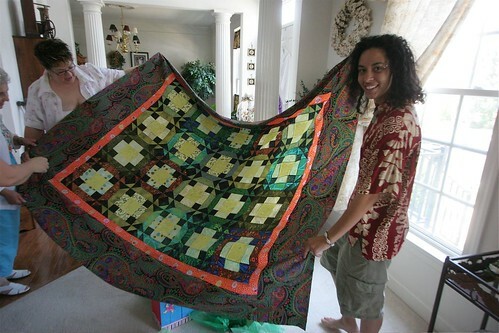 His mother has asked us to recover and reconstruct a quilt he recieved when he was a baby. He still sleeps with this quilt. Wrapped around his head. He seems like an otherwise average well-adjusted twenty year old … who gets attached. Sweet. In any case, when we have our website up (soon), I will post it here and you can see what I do some of the other parts of my day. I won’t be around much this weekend, it’s the annual fam damily get-together at the lake. My brothers arrive today. My parents arrive tomorrow. We (of course) have been here for two weeks. Well, LightUncle2 arrived last night with my oldest niece; his wife and youngest daughter stayed back home for a variety of reasons. LightUncle1 arrives today with his wife and two children. We’re all going to watch LightGirl scrimmage at her hockey camp this afternoon. Tomorrow – blueberry picking in preparation for the annual pancake cookoff on Sunday morning. The nieces and nephews have such high standards you see. And, just in case you were wondering at the paucity of Olympic pondering here. There’s no television set in the cottage at the lake, so I have not watched any Olympic coverage. I’ve read about three articles. But otherwise, I am an Olympic-free zone in my mind. It’s sort of nice. Have a great weekend and I’ll “see” you on the flip side (as they say). … for a special announcement. Some of you may remember a period of whining and complaining earlier this year when BlazingEwe and I were involved in making my/our guild’s raffle quilt (pattern is Shakespeare In The Park, copyright by Judy Martin in The Creative Pattern Book). It was finished in June, quilted and everything. We’re kinda happy with it. … and WON … Best Of Show AND First Place in our category (made by a group). Today marked a milestone of sorts. One day about 14 years ago I signed up to take a meal to a woman who’d just had some sort of surgery. She had two small children and her husband worked alot of hours. The family were members of our church and it was the beneficent thing to do. The children were about 4 and 1 (at the time) and LightGirl was around 6 months old. I figured I’d drop the meal off, say a few words and leave. It was around LightGirl’s naptime afterall. I think I left about 3 hours later. The way I figure it I think we’ve spent the equivalent of a year of our lives on the phone together. Most of that laughing. I spent the wee hours of the morning with her oldest two when child number three joined them, and then child four and then finally, child number five (who is now five). Child number 2 and number 3 are LightGirl and LightBoy’s ages … they have grown up together. The oldest, a girl, graduated from highschool yesterday. A milestone of sorts. My first friend to have a child graduating from highschool. More than that though … I’ve known this girl virtually her whole life. I remember more about the funny things these children said when they were little, than my blood nieces and nephews. We hid out together during tornado watches and cooked chicken feet one day. We’ve watched each other’s children for overnights and for vacations. We fell away from each other for a few years for no particular reason. We staying in sporadic contact, but falling off of a cliff in the middle of the mines of Moria made me a little difficult to reach for a while. So when we received the invitation to her graduation party, our whole family was delighted. Even better was LaughingEye’s reaction when she opened the door this afternoon. Her whole body radiated joy. I made her an album quilt … a quilt with space for her friends and family to sign. She was thrilled. I am thrilled. And I sat, absorbed back into my friend’s family and realized that friends really are the family you choose. And I do mean that literally. Quite literally. Eight bobbins and two large spools of thread equals miles of thread. We are finished. Well, we’re finished with our part. Now we take it to a long-arm quilter to have the three layers that make it a quilt put together and stitched. But our part is finished and we are happy with it. So happy that we have both agreed that we will likely spend far too much in raffle tickets in our attempts to win the quilt back … because now we LOVE it. How can we give it away to a stranger? We will if we must … but only after we take plenty of photographs. So as I may have mentioned in my earlier post, I am somewhat pre-occupied with this quilt lately. It’s taking up all my time and all of BlazingEwe’s time too. We are actually ripping our hair out. This quilt is composed of 81 separate blocks. There are 49 that measure 12 inches square and the remaining blocks measure 6 inches square. In January and February we handed out kits for these blocks (complete with directions) and all the fabric needed for each block, pre-cut, at our guild meeting. We asked for the blocks to be back by the March guild meeting. Most of them came back. A few more trickled in at our show a week later. We had to chase the rest down. Finally, about ten days ago, we sat down and triaged the blocks. Here are some things you need to know about quilting. First … a block that will measure 12 inches square in a quilt, really is 12.5″ square all by itself. You have to figure for seam allowances (a quarter inch for quilters). Second, some quilters are slap-dash quilters and others are OCD quilters (I fall into the latter category, btw) … and yes, OCD stands for the same thing here that it does in ordinary life – obsessive-compulsive disorder. Third, a block sort of indicates that the general shape of the thing should be square, that is, four equal sides with 90 degree angles. That’s what you’re looking for as an end result because it makes the whole thing go together well. So, as I said, we triaged the blocks. Of 81 blocks, 40 were not within tolerances. That means … they were either not square, or not 12.5″ (or 6.5″) in measurement. Now we know that everyone is different and sews differently so, that means that very few people are going to have exact blocks. Well … I do, but I’m OCD about it. However, in order to make it work, they have to be within about an 1/8″ of an inch on all sides. That’s what I mean by “within tolerances.” Several blocks had curved outer edges. That does not meet the definition of a square to me. We began making notes on post-its and pinning them to each block. Notes about what needed to be adjusted, changed or perhaps outright redone. Sixteen blocks needed to be recut and redone from the get go. We had to go buy new fabric. In one case this involved a roundtrip of two hours. Don’t ask. There was ranting and cursing involved. We have about half of the quilt top together. We put the other half up on our jerry-rigged design wall last night and sighed. We are both tired and tired of this quilt. Here’s the thing though. We’ve seen the quilts that most of these ladies have made. They are beautiful and wonderful. How is that possible? These blocks were/are a mess! It was a mystery. Then I realized this … if you make the same block with the same mistake 28 times it doesn’t matter. Those 28 blocks go together just fine. Structurally, they work together well. They fit together and the mistakes and idiosyncrasies disappear into each other. They are not apparent. However, when each and every block has a different mistake and idiosyncrasy they do not fit together well. They bump up against each other and look very ugly indeed. There are gaps where there should be joints. Intersections which do not intersect well. Taken on the whole, a community quilt is a very bumpy, wavy adventure. It makes the OCD quilter (me) somewhat nuts. One day as I was sewing along I had a revelation. Quilt blocks are like people, or maybe people are like quilt blocks. Structurally we all have mistakes and idiosyncrasies. We don’t notice them at all when we are alone or in our families because they are unique to us and we make them all the time. When we’re making our own blocks and quilts, these mistakes and idiosyncrasies just fit right in to whatever we’re doing at the time. It’s only when we get out into the larger community that our unique bits stand out in contrast to the unique bits of everyone else and the joints don’t fit right. There are gaps and ugly intersections. Places where the fabrics just clash and hurt your eyes (or ears). When you’re making a quilt, you can take apart the offensive blocks and put them back together so that they fit more better. In real life, there’s not so much you can do with offensive people. So we have to figure out how to make do with what we have instead of remaking it to suit ourselves. But that’s the problem, isn’t it? We each want to remake the other people/blocks to suit us rather than let them be and figure out how to make the community quilt just as it is. Now wouldn’t that be an adventure? Last September BlazingEwe and I had a brilliant idea. There was some fabric involved. It was speaking to us and telling us what kind of quilt it wanted to be. So we told our guild that we’d design and execute the guild’s raffle quilt for 2009. In January we handed out kits and directions for 80 blocks. In March we got most of those back. Saturday we triaged those blocks. Forty of them need work. Need to be taken apart and resewn. About 2/3’s of those must be re-cut and resewn. The photo above is half the quilt. We’ve been working for a week now. That photo was taken on Wednesday. We’ve done a lot more since then. Many of the holes you see in the photo have been filled. But there is still a lot to do in this half. Then we still have another half to put up on our design wall and pick apart, then resew. I have no life. I have this quilt. It has to be done and ready for the quilter by May 7. We have been to the quilt shop 3 times for fabric. We drove a two hour round trip to get one piece of fabric because … well … it’s a long story. It was our favorite piece and we had to have it. All of this is to say, I am otherwise occupied for the time being. I am sporadically working on a few posts here and there. So you’ll hear from me now and again. But I’m busy making a vision come to life. In the meantime here’s a great project for the spring. Get involved counting bees and planting sunflowers … be part of the Great Sunflower Project. Let’s have a sunflower contest. Everyone get some seeds and we’ll all plant them on the same day … how about May 1? Then we’ll see how tall our tallest sunflower is on September 1. I’ll send a prize to the grower of the tallest sunflower. Let me know in the comments if you’re in. Sheesh … it’s been quiet around here for the last couple of days. Where’ve I been anyway? I went to the Mid-Atlantic Quilt Festival last Wednesday with BlazingEwe and didn’t get back til yesterday afternoon. We both had quilts hanging there. This was a first for us and quite exciting. We took classes; one that would help us be less precise and one that would help us be more precise. We’re so conflicted! Both teachers were very good, but we really connected with the second, who is about our age. We had lunch with her. Our teacher from last year remembered us and that was a thrill, too. All of this would be much more wonderful but for the fact that we’re usually the youngest women in these classes by about 20 years! So, we sorta stand out and not for our skill, technique, or talent. Perhaps it’s our charm. In any case, you’ll see my quilt in next month’s issue of Porpoise Diving Life which is being guest edited in March by John Smulo. Porpoise Diving Life is always wonderful, but this year’s issues are a special treat because a group of us have gathered together to give Bill Dahl a sabbatical at his request. He’s writing a book and asked for some people to step forward so that he could focus his efforts. This month (February) is under the expert care and direction of Pam Hogeweide. In a future post, I’ll give you a list of the upcoming guest editors, so you can keep your eyes open. It promises to be a great year. I came home from the festival with a renewed sense of how I want to organize and purpose my life. My path is still not clear, but I have a better sense of some of the things that need to be in each day. I know I need to have color and art be part of each day. I know I need to write each day as well. Perhaps doing these things will help the path become clear to me. Think about that for a while. Think about it in terms of the church in the western/industrialized hemisphere. Who do we follow and consider special? And why? Who floats to the top, and who wallows in the quagmire at the bottom? We like the Horatio Alger stories that it’s bootstraps, hard work, innovation and smarts that get people ahead in this country. It is our mythology that race, gender, poverty or a combination of those will not effect where we end up in this life. So, why is this important? It is important because we are wired in some way to believe that those who are famous are leaders. They are the ones who have smarts, education, talent, or general chutzpah in some way that we should listen to. But should we? What if they’re just someone that an editor or producer thinks will sell? Tonight, a list of the most commented posts of the year. I just went through by month and picked the post for each month with the most comments. August was unique because there was a tie that month for most comments and it was a high too … 26 for both posts. So, I’ll begin with January, end with December and see where the road takes us. Having spent so much time in my own writing this evening, I no longer have any confidence in myself. What am I thinking? Oy … my 7 readers are filled with grace. Thank you from the bottom of my pea-pickin little heart. Tomorrow, or Sunday, a list of my favorite posts from the year. 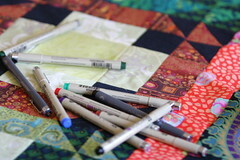 Maybe a photo of the quilt I’m designing too as a special extra (it’s an art quilt, so it’s small).